Culture has many dimensions. Some cultural characteristics have to do with beliefs, values, or norms, including ideas like language and religion. But another dimension of culture is represented in physical objects and spaces: different cultures have different types and amounts of things. These things are called material culture, all the objects and spaces we use to define our culture. We can tell a lot about a culture by looking at what people have and build. Material culture includes clothing, food, housing, transportation, and buildings. It also includes art. While paintings and sculpture are obviously physical objects, music is also included as an artistic expression of material culture. We extend material culture to one other area, sports and recreation. This is a little less obvious but sports are played on custom fields (a baseball field is different from a soccer field) and with unique equipment; the rules make up an immaterial part of this material culture. Material culture can be divided into two main types, folk and popular culture. In reality many cultures can be placed somewhere on a continuum between extreme examples of the two types, but considering the differences helps us to understand the division. Popular culture is often associated with economically developed (rich) places, while folk cultures are more often associated with economically developing (poor) places. This is in large part due to the relationship between popular culture and commercial culture: some popular culture is deliberately created or promoted in commercial attempts to increase sales of a product. Popular culture is spread rapidly by electronic communication and changes rapidly over time. Folk culture tends to be clustered in unique places and change slowly. The spread of popular culture around the world represents cultural globalization, a phenomenon that can result in conflict between local and global cultural values. Geographers may study an entire culture all at once, but a more accessible way to examine cultural differences is by looking at the customs of material culture. A custom is widely accepted behavior or set of behaviors around a particular part of life. For example, it's a custom in the United States to communicate by phone, and cellular phones are becoming ever more common. This is becoming customary to the point where it is a little unusual to meet someone in the United States who does not own a cell phone. We'll start with two paragraphs defining folk and popular culture, including important differences, before moving on to concrete examples that help us understand these differences. Folk culture is an assemblage of traditional objects and customs used by a particular group of people, very often in a particular place. Geographers find folk culture interesting in part because of these ties to place and history. Because of these characteristics of folk cultures, there are many different forms of folk culture practiced around the world. As we travel from place to place, we immediately notice differences in material culture, and those differences are most dramatic among different folk cultures. Folk culture is rooted in tradition and very often has ties to the local environment. Popular culture is an assemblage of modern objects and customs used widely by diverse groups of people; some customs may or may not be as widely practiced but the most popular elements of popular culture have a global reach. Popular culture has its origins in mass production, usually for commercial purposes (to make money). Popular culture is spread through technology, especially by television, radio, and the Internet. Finally, in part because of its origin in commercial production, popular culture is concerned with consumption, sometimes as an overriding priority that ignores the local environment. Different cultures have different customs around food based on their own preferences. Cultural preferences may exist for one type of food over another, or against some types of foods. We can examine some distinct, if not unique, examples of these preferences by looking at traditional folk foods. Many traditional foods have origins in preserving food through fermentation for survival during a long winter or finding uses for an entire animal. For example, haggis is a traditional dish of Scotland consisting of sheep heart, liver, and lung cooked with other amendments in a sheep's stomach. While few without Scottish heritage are interested to try haggis, the dish is still prepared and served by Scots within or without Scotland. Another example is lutefisk, whitefish preserved with lye, from Norway, Sweden, and Finland. Still another is kimchi, a Korean style of fermenting vegetables. In each case strangers to the culture may find these foods odd, unappealing, or sometimes even foul-smelling or foul-tasting. 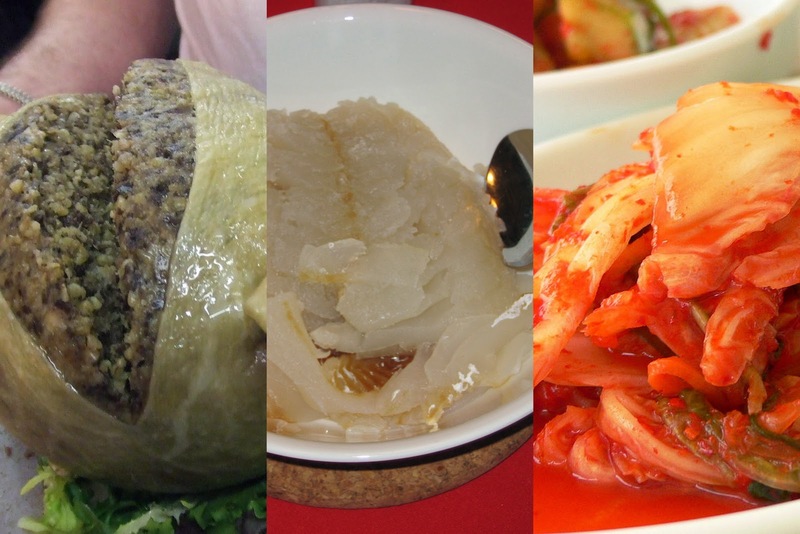 Left to right: haggis, lutefisk, and kimchi. Photos by Tess Watson (https://www.flickr.com/photos/tessawatson/369389063), mtcarlson (https://www.flickr.com/photos/mtcarlson/2178666901/), and Craig Nagy (http://www.flickr.com/photos/nagy/23219340/) used under CC BY-SA 2.0 license. 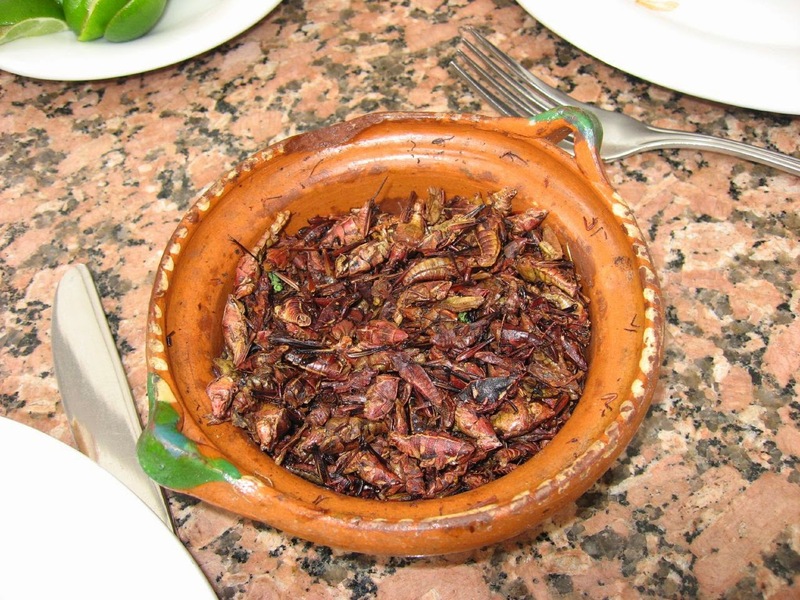 Chapulines are fried grasshoppers; in Mexico they can be purchased in markets, as street food, or are even sometimes served in restaurants, as shown here. But some other cultures have a taboo against eating insects, meaning they might not consider this food as a potential source of sustenance. 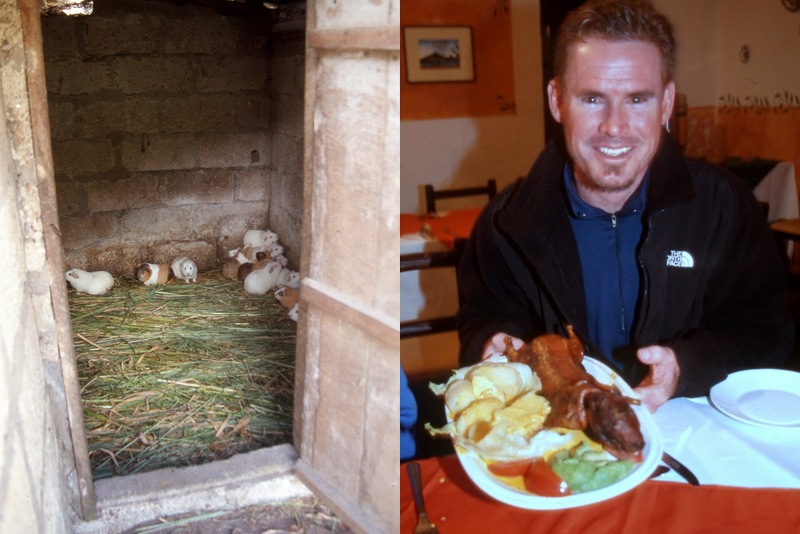 In the Andean highlands of South America, cuy (guinea pigs) are not kept as pets but rather raised as livestock (left) to be cooked and served as a valuable source of protein and a delicacy (right). Both photos by Tim Scharks, 2003. In some cases these foods were once survival foods-the only known way to preserve calories for a long winter or through a time of famine. But even now that these societies no longer face such a struggle to survive, the foods remain a celebrated part of the culture and may even be prepared and served ceremoniously to mark particular celebrations or events. In some cases the foods are considered a delicacy by the culture that has grown around them. Popular culture and commercial culture are distinct concepts, but sometimes difficult to distinguish in reality. Commercial culture is mass-produced for the purpose of making money, while popular culture may be mass-produced for some other reason. To illustrate commercial culture, consider video games. Most console video games are sold, but even "free" games for tablets and phones sell in-app purchases or display advertising. In either case, the games are created, marketed, and distributed to make money, with entertainment a secondary goal. But there are numerous examples of popular culture created for entertainment or education without a profit motive: Intramural or club sports are not for financial gain, and many artists practice painting or ceramic art in popular styles without any intention of selling their finished works. In other cases, such as fashion, it's unclear whether culture is driving commerce or vice-versa as corporations either try to catch up with new trends or try to create the trends through marketing. In contrast to folk culture, popular culture tends to be mass-produced, widespread, and therefore more uniform. An example of a popular food custom is hamburgers and french fries. While sometimes referred to as "American" food, there's not a single cultural hearth that's obviously the source of this food custom: wrapping low-quality meat between two buns and served with fried potatoes has become so widespread that it's just popular food, not "from" anywhere anymore. The global extent of the brand should be apparent from the map; what will become more apparent after reading Chapter 9 of this book is that most countries without McDonald's are also some of the economically least developed. A McDonald's restaurant in New Delhi, India presents familiar text and graphics with some important cultural differences: Beef is not available and vegetarian options are much more common. 2007 photo by Tim Scharks. Note that popular foods can also be taboo in some cultures. McDonald's restaurants do not serve beef in India because of a taboo by much of the Hindu population against the consumption of cows, and while restaurants serve beef in predominantly Muslim countries, bacon is not on the menu in some as a burger topping because of a taboo against the consumption of pork. So even highly commercialized popular culture, like that shown above in the photo of McDonald's, can change with respect to local preferences and taboos. While popular food customs may respect certain cultural preferences or taboos, the general pattern is to present uniformity in product: Despite the example just given McDonald's worldwide tends to sell hamburgers and french fries everywhere. In contrast, folk foods are much more likely to be based on place: folk food customs draw on foods from the local environment because the costs of importing exotic foods from far away are too high. Produce for sale in a regional market, Mto Wa Mbu, Manyara, Tanzania. 2013 photo by Tim Scharks. The grains, legumes, and vegetables are all grown and harvested within a few miles of this market, with the possible exception of the small pile of coconuts visible to the upper-right. Folk food customs owe their distinctive differences from other food customs in part because they use local ingredients. While an American could easily travel to the grocery store and purchase everything necessary to cook in a traditional French style, that might not be so easily done at this market. Similarly, folk clothing and housing styles are more likely to incorporate elements of the local environment. Houses might be built from bamboo if it is plentiful in the area, or clothing might be woven from wool if sheep are raised in the region. The previous section introduced the idea that popular culture occurs in areas of relative economic prosperity. Because popular culture is associated with commercialized production, companies that profit from changes in preferences try to influence those preferences and increase the pace of change. We'll turn away from food culture and look to a different, specific part of material culture: fashion. In the economically developed world, clothing is routinely thrown out before it is completely worn, in fact many articles of clothing are worn just a few times before being discarded by the original owner. (For those of you quick to think that clothing in places like the US is passed on and used by less fortunate people until it's truly used up, wait...that's covered later in this book!). So why do so many people buy new clothing year after year when their current clothing isn't worn out? The short answer is because popular culture tells them to. A multi-billion-dollar international fashion industry attempts to influence consumer preferences, and consumers in turn demand new styles and colors. Defining one's success or well-being in terms of how much one owns or consumes is called consumerism, also known as materialism. Critics of popular culture as practiced in the rich countries of the world often find fault in consumerism as wasteful, not sustainable, or unethical in the face of crushing poverty in other parts of the world. Popular culture has always changed more rapidly than folk culture, but increasing connectedness is driving the pace of change ever faster. Newspapers and magazines were once the dominant means by which popular culture spread, soon to be replaced by television. Today TV is declining in importance in comparison to information received from the Internet, including social media like Facebook, Twitter, and Instagram. Each innovation represents more total information and a faster rate of change. The ability to make a call or send a text from a cell phone has changed very little in the last twenty years, and even less so in the last ten. Features added to cell phones have made minor improvements to calling and texting but have mostly focused on other uses for the phones, including taking pictures, updating social media, sending and receiving email, and geographic navigation. All of these features increase the cost of the phone, and, importantly, increase the pervasiveness with which the consumer receives media messages about popular culture. With the addition of more and more technology to phones, manufacturers are in competition to meet consumers' demands for the latest, highest-tech phone. Some consumers in turn use their phones as status symbols. Advertisements from phone manufacturers sometimes try to shame consumers into buying the latest version of a phone. Modern cellular phones don't represent a pinnacle or even plateau of popular culture, they represent a way for advertisers to put more messages in front of consumers' faces every day...the same is true for the Internet and its various social media platforms. Away from all of this popular culture, folk culture remains rooted in place and passed down from generation to generation. Returning to the case of clothing, young adults in a folk culture are likely to wear clothing in the style of their parents. In the highlands of Ecuador, Quechua women (below) wear similar clothing-layered skirts, embroidered blouses, and sweaters-regardless of age. Another distinctive folk cultural clothing accessory of the Quechua people is their small-brimmed felt hats, apparently adopted about 100 years ago with their importation from Europe but persisting today as a folk cultural form. 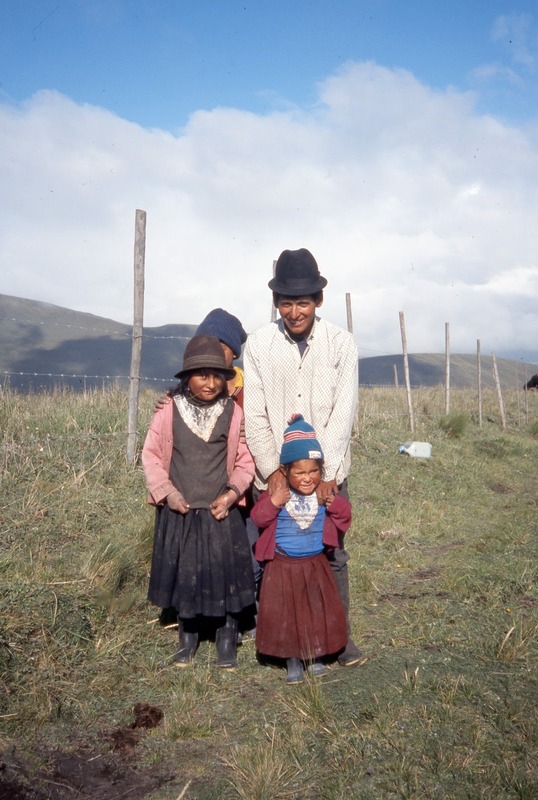 Quechua family near Urbina, Chimborazo, Ecuador. 2003 photo by Tim Scharks. The increasing connectedness of places on Earth has the effect of shortening the virtual distance between them. With enough money a person in North America can travel to nearly anywhere on Earth in less than 24 hours, and some forms of communication, like email, take mere seconds to travel the globe for zero per-message cost. Economic and social forces increasing connections between places on Earth is called globalization. Globalization may appear inevitable and there are many potential benefits from increased communication and connection, including opportunities for economic development. On the down side, globalization may also create opportunities for economic exploitation. Buddhist monks dedicate their lives to meditating and practicing Buddhism; in becoming monks they give up all material possessions and live a simple (indeed, monastic!) life. 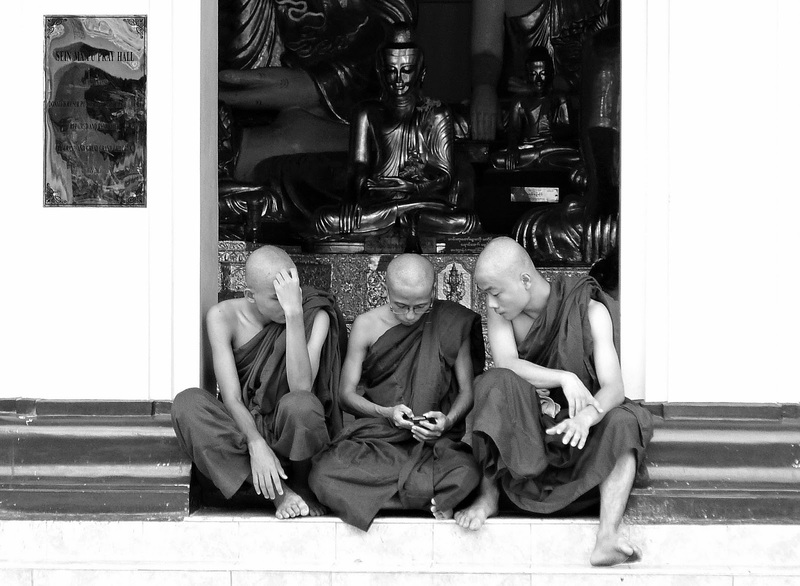 So is it possible for monks to use modern technology while still following that life? The topic of modernization and the monastic life is subject to much debate that won't be discussed here, but hopefully the potential issues are easy to understand. The globalization of fast food also generates complaints from those wishing to preserve more distinctive local cultures. Every foreign restaurant chain represents one less local restaurant. Every hamburger consumed represents a local dish forgone. While it's evident that these forms of popular culture would not spread if local consumers didn't support them, those who worry about their spread argue that local cultures won't appreciate what has been lost until it's too late. McDonald's restaurant, Doha, Qatar. 2007 photo by Tim Scharks. McDonald's is a common symbol of this cultural globalization. In the photo above we can tell at second glance that it's someplace different than the US or Canada, but at first glance (or perhaps a glance without glasses on) it looks much like anywhere else in the developed world. This is another concern that some geographers have about the globalization of popular culture: Not only might popular culture represent a threat to folk cultures, it also might make the world a more boring place to travel and explore. However, we do see folk cultures being kept alive and preserved in the face of economic and cultural globalization. We have reason to believe that people will want to keep their own regions of the world different enough that they have their own unique "sense of place."